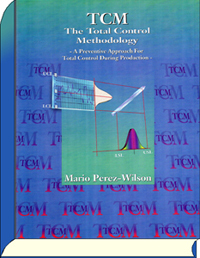 The Total Control Methodology (TCM) is a statistical process control system that integrates the necessary statistical tools to establish a preventive and continuous plan to control input variables (machine parameters and process variables) and monitor output variables (product characteristics). TCM maintains processes stable, predictable, capable of producing within specification limits, and most importantly, it fool-proofs the process of defects. A typical SPC course teaches you how to control product quality by control charting product characteristics after the product is produced. This type of control is reactive. TCM is proactive! TCM teaches you how to control the process and process parameters -- independent variables, or the input to the process. As a consequence, this will permanently assure control of the output of the process (product characteristics), and will result in non-defective product quality. 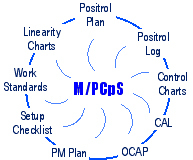 The integration of SPC (control charts) with other tools such as Positrol Plans and Positrol Logs, Corrective Action Logs and “Out-of-Control” Action Plans, Linearity Charts, Preventive Maintenance Plans and Work Standards, launched the Total Control Methodology. TCM was implemented at Motorola (starting in late 1980s), in production as the final stage and culmination of a Machine/Process Capability study. In this course, you will learn how to apply Shewhart control charts, Positrol Plans, Traceability Logs, and OCAPs, as well as all the other new elements of TCM. Participants will receive one copy of Total Control Methodology (ISBN: 1883237041) plus additional copyrighted training materials. TCM was first implemented at Motorola's Government Electronic Group (FMU-139) by Mr. Perez-Wilson, in production, as the final stage and culmination of an MPCpS® study. Total Control Methodology is the integration of a number of critical production control methods, such as: Positrol Plans, Positrol Logs, Corrective Action Logs, Corrective Action Plans, Linearity Charts, Preventive Maintenance Plans, Setup Checklists and Work Standards. Establish a systematic way to control the production processes. Eliminate operator-dependent defects in production. Identify and eliminate assignable cause variability and stabilize machines and processes. Learn to define which variables to control and which variables to monitor. Establish the right balance between under-controlling and over-controlling the processes. Learn how to control the input rather than the output--when it is already too late. Freeze the production process recipe with PosiTrol and control influential parameters. The Total Control Methodology, TCM, is a system that integrates the necessary tools to establish a preventive and continuous plan to control critical machine parameters, significant process variables and product characteristics. This maintains a stable, capable and fool-proof process free of defects. This is, by far, the most efficient way to learn the application of statistical process control methods and the Total Control Methodology.